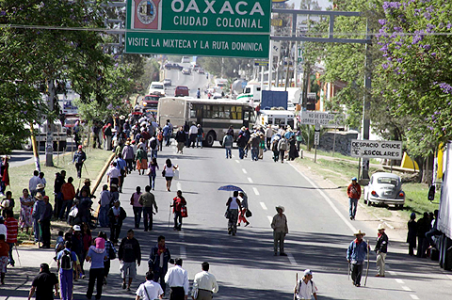 Jan-Albert Hootsen filed this report on the Oaxaca teachers’ strike for FoxNewsLatino on Wednesday June 22. NOCHIXTLÁN, Oaxaca – The air in this small town in Oaxaca, an impoverished and mostly indigenous state in Mexico’s rural south, is heavy with the smell of burning tires. The highway, a strategic one that leads traffic from the neighboring state of Puebla to state capital Oaxaca de Juárez, is blocked on all sides with heaps of dirt, burned out carcasses of cars, buses and trailers, pieces of wood and rocks. Dozens of trailers stand in line just before the overpass, waiting for the moment they might pass. But they won’t anytime soon. Nochixtlán is reeling from the disastrous confrontation Sunday June 19 between members and sympathizers of the National Coordinator of Education Workers (CNTE), a dissident teachers’ union, and law enforcement. State and federal policemen, some 800 in total, swooped in to clear the highway of a blockade, but fired live ammunition into a rowdy crowd of protesters armed only with sticks, stones and molotov cocktails. By the end of the day, at least six lay dead, more than a hundred were wounded, the municipal palace and the local station of the federal police set on fire. And the blockade is still there. Dozens of protesters are still keeping watch at the overpass where the confrontation took place. They painted anti-government slogans on the walls and prepared crates with bottles and wraps, ready to become molotov cocktails should the policemen come back. Protesters and the Mexican government have been trading blame over who was responsible for Sunday’s clashes, with federal and state authorities claiming live ammo was used after unspecified ‘radical groups’ attacked policemen, after the dislodging of the protesters initially happened peacefully. The authorities changed their version of the events several times, with interior secretary Miguel Ángel Osorio Chong initially claiming the police weren’t carrying arms. Federal police chief Enrique Galindo later admitted his men did indeed carry guns. On Monday, Oaxaca governor Gabino Cué said in a press conference that the policemen adhered strictly to protocol and that force was used ‘rationally’ and with ‘due respect to human rights’. But union members and its sympathizers deny any kind of radicals or infiltrators being present and say the police opened fire on unarmed civilians. During a visit to the scene of the confrontation on Monday, protesters showed FNL dozens of bullet casings of different calibres, which they said were found in places where the police was shooting at them. One elderly man working at the Nochixtlán municipal graveyard told FNL that, during the attempt to dislodge the protesters, policemen had run into the graveyard, forced him to the ground and stole his wallet while threatening to kill him if he did not comply. “They took all my money and started shooting at people just outside the graveyard”, he said, asking not to be named out of fear for his safety. He showed FNL several bullet casings at the graveyard, at the spot he said the policemen were shooting from. “From where I could see, the police began to shoot without provocation”, he added. At the local hospital in Nochixtlán, one employee confirmed to FNL to have treated at least 40 wounded and said four people had come in with bullet wounds, some of them in the head and throat, and that four people had died at the clinic while another person had died on the way to another. He asked to remain anonymous due to the sensitivity of the situation. Sunday’s clashes took place in the context of larger protests organized by the CNTE and its sympathizers in the wake of the arrest of Rubén Nuñez, who heads Section 22, the state chapter of the union in Oaxaca, which is widely seen as the most powerful section of the union. Nuñez was arrested June12th on money laundering charges, but members of the union say he is a political prisoner due to the opposition of the union against sweeping education reforms introduced by president Enrique Peña Nieto in 2013. The CNTE is vehemently opposed against the reforms, which, among others, introduce mandatory testing for all teachers. The union claims the tests, which will allow the government to fire teachers who fail them, are unfair to teachers in rural areas where schools have less resources. The Mexican government says the reforms are necessary to improve the quality of nationwide education, which ranks an absymal last among members of the Organization of Economic Cooperation and Development (OECD). Interior secretary Miguel Ángel Osorio Chong announced on Tuesday that the federal government invited the CNTE to the table to discuss recent events and attempt some kind of dialogue. But after last weekend’s violence, some believe a dialogue will be very difficult, especially with Section 22-leader Nuñez in jail.